If you've expected just by seeing the film's title or director that Black Swan is not going to be an ordinary "Swan Lake" tale, you've been right. Similarly to another 2010 movie Inception, Black Swan is a film which will hold your mind busy for quite some time after its ending. It is a little bit hard to watch but beautiful movie with great directing and cinematography work, lots of symbolism and really good acting performances. In a nutshell, you have to see this film, even if you do not like it for some reason. Formally, Black Swan is about producing the "Swan Lake" ballet on a New York City stage by the artistic director Thomas Leroy (Vincent Cassel). He wants to replace his long-lived prima Beth MacIntyre (Winona Ryder) with a new lead so he's in need of a ballerina for the role of both, the White and the Black Swan, and such a role is dreamed of by every female ballet dancer in the world. Nina Sayers (Natalie Portman) is a ballerina that wants the part of the Swans with her entire heart and she is ready to do pretty much everything in order to get it. Naturally, she has a lot of competition coming from several other ballet dancers including a new ballerina Lily (Mila Kunis). While the delicate and innocent Nina is a perfect match for the White Swan, Lily is her counterpart being open-minded and seductive. Nina must find a way to represent both swans if she does not want to lose the role. But it's a hard task for a fragile young woman who is also being suffocated at home by another former ballerina in the face of her mother Erica (Barbara Hershey). Informally, Black Swan is a film about physical and mental pain, obsession, madness, self-destruction, perfection. You may find in some other reviews that it's a thriller or mystery and while those are not completely wrong, the movie should be primarily labelled as drama. 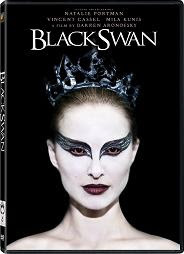 You may also read there are some supernatural elements in the film which is not exactly the case as even if we assume there are such unnatural traces in Black Swan, they are just used in order to describe some psychological sides of the characters rather than being really unearthly forces. Saying that Lily represents the evil counterpart of Nina is also not completely correct cause Lily is just more easy-going and playful than Nina rather than being bad tempered. The evil in the movie is mainly fictitious and is used to emphasize certain mental condition effects. There are some hints of Nina being sexually abused by her mother but nothing that really proves it. That being said, there are lots of contrasts in Black Swan. As the colors of the both swans prompt, white and black collide pretty often in the film. They are everywhere: in clothes, underwear, makeup, etc. White and black even change their bearers in different sections of the movie representing a shifted perception of the corresponding character. You may see various persons depicted as potential dark ones during the film but you rarely know what to believe until the end of it. There are many other symbolic references in Black Swan but let's not spoil the movie for you. There are enough visual and sound effects to help you see and even hear Nina's physical impersonation of a swan. Plenty of mirrors are used to present the notion of duality better. The hue and saturation of colors in the "white vs. black" film is also fascinating. And the musical score of the movie, hugely influenced by "Swan Lake", is an ideal addition to the overall experience you get from Black Swan. The acting is superb throughout the film. Vincent Cassel is awesome as the passionate ballet director. Winona Ryder has a little portion of time on the screen but she authentically portrays the retiring against her will prima Beth MacIntyre. Mila Kunis is beautiful, seductive and playful thus perfectly suitable for her role. Barbara Hershey plays a loving, yet frightening mother. And Natalie Portman is an incredible lead. It's not easy to play such a sad, desperate and obsessed woman with just a few sparks of living for a whole movie. She really deserves to get the Academy Award for her performance. The director, Darren Aronofsky, proves again he is a master of making non-standard movies. While non-standard is not a synonym for good and this is even valid for Aronofsky's own movies to some extent, Black Swan is probably his most balanced film to date. It's not so disturbing as, e.g., Requiem for a Dream and it is not so close to the "mainstream" as The Wrestler. Being a kind of a mixture of themes explored in previous Darren Aronofsky's films, Black Swan could be treated as a good entry point to his works. It's a beautiful nightmare, not offering great surprises but firmly capturing your attention and probably requiring a second viewing for full appreciation of its details. Find out more movie reviews in the Review Maze.